For many years the Lindeman Island Resort has bee catering to all types of different travellers, individuals, couples, families and groups. The Lindeman Island Resort is well positioned in the Whitsunday Islands ensuring that you can get to all of the main attractions in the region but still be removed enough to provide total tranquility and relaxation. 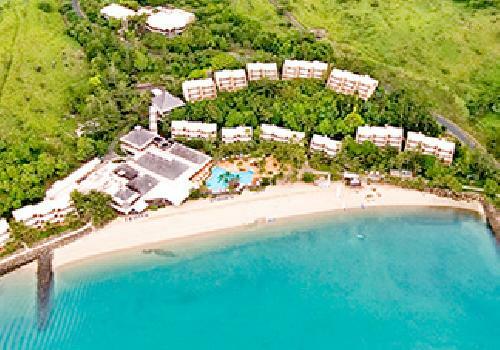 The resort is located on the edge of the COral Sea and is surrounded by dense forest, which brings together the best of both worlds in a tropical island paradise. Lindeman Island's location within the Whitsunday Islands in the heart of the Great Barrier Reef and has a range of activities of offer to guests including snorkeling, scuba diving, quad biking, horse riding, bush walking activities and more. Some of the hotel accommodation at the Lindeman Island Resort is tucked away amoungst the trees so the only noise you can hear is the birds, whilst other hotel rooms are located on the edge of the water so you can get a great view over the Coral Sea and can easily join the friendly tropical fish for a relaxing swim. When you stay at the Lindeman Island Resort you can explore the stunning flora, fauna and reef surrounding the island itself. Also the Great Barrier Reef with all of its popular attractions and the neighbouring Whitsunday Islands await exploration. There are many different activities that you can partake in at the Lindeman Island Resort including scuba diving, snorkelling, jet skiing, quad bike tours, horse riding, island cruises and even scenic flights over the entire Whitsunday Passage. By taking a cruise to the peaceful and untouched Whitehaven Beach you can indulge in a spot of beach volleyball, go for a romantic walk or even go beachcombing.